This stoneware bowl draws on the significance of a circle as a symbol of unbroken love and community. Pass the poetry, please. Bryan Becker's hand-thrown design draws on the significance of a circle as a symbol of unbroken love and community. The beautifully glazed stoneware server bears the poetic inscription, "This bowl shall have no owner, its journey never ends. It travels in a circle of our family and our friends." High-fired to withstand the rigors of microwave, dishwasher, and oven, it's an instant heirloom and a great housewarming gift. Handmade in Hartland, Wisconsin. Bryan Becker has had his hands covered in clay for a long time. He first discovered his love of pottery at the age of 15. With self-taught skills and family encouragement, he gained the confidence to pursue a dual degree in art and business. When his passion for pottery grew, he opened his first pottery studio in 1983. 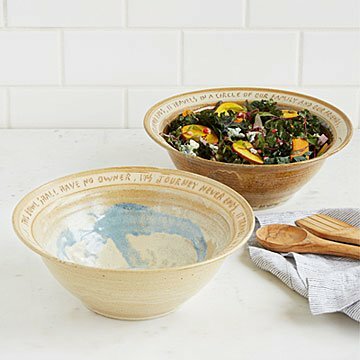 Bryan's inscribed bowls have gained popularity with those seeking hand-crafted gifts that inspire with their poetic sentiments. Uncommon Goods is my "go to" gift spot. My friend called me right after she opened it. She said it looked like you were looking down into the sky. Both she and her husband said it was stunning. It was a 'just because you're my friend and I'm here for you always' kind of gift. She said she's placed it on her kitchen counter and loves it!! My friend will be using this for all occasions; she's in love. Got this for family members so they think of each other even though we are spread apart. They host dinners often. I hope it will be used then. I did. I bought 1 for my son and 1 for my daughter. It is perfect size for family or small gathering of friends. Delicate colors. Began a new tradition "Circle of family and friends" Bowl. This bowl (no owner) is passed around to a family or friend every other month, for them to display in their home. Then it comes back to us, every other month. When each month is over, whomever had possession of it has their name, month and year written on the side or bottom of the bowl. So far, it has traveled around our family & friends for 16 months. As more names are placed on it, the more everyone appreciates the tradition.